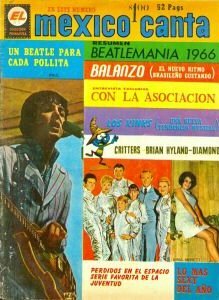 A Mexican magazine (Mexico Canta) published by Ediciones Latinoamericanas in 1966 and includes 52 pages. Printed in Spanish language and measures 10x7 1/2". Articles features photos/article on the classic Lost in Space TV series, and a tribute to the Beatles.